Udforsk Philadelphia i dit eget tempo, med hele dagen billetter til en hop-on, hop-off bus tour, der stopper ved 27 af byens største attraktioner. 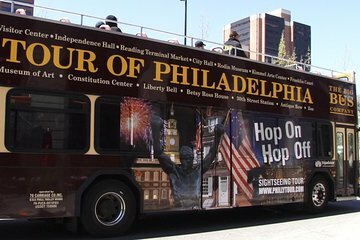 Nyd udsigten fra en open-top, double decker bus som din erfarne guide deler insiderhistorier om Philadelphia historie og kultur. Vælg de websteder, der interesserer dig mest, og hold så meget tid som du vil. Spor amerikansk historie på Betsey Ross 'hus til Ben Franklin's Grave, eller oplev verdensklasse shopping og Philadelphia Museum of Art; tag chancen for at gøre turen din egen. 1-, 2- og 3-dages passager til rådighed. Learned so much about the city of Philadelphia. Our tour guide was very knowledgeable and we enjoyed him. Highly recommend this to any visitors to Philly. Nick and Tony were great. Nick was excellent with his knowledge, people skills and was great fun to do the tour with. Thankyou! The guides are very knowledgeable. If you want to get a good overview of the city this is the way to go. The full-day pass was a great deal and very helpful in terms of learning all sorts of neat facts about Philadelphia. It rained the day of our pass so it was nice to have a warm, dry place to view the sights. Very good trip. Weather was wonderful. Service was great and guide Will was congenial, funny and very informative. Would highly recommend for others. P.S. If you are plus size either by height or weight, you will find the seating cramped. This does not detract from the quality of the tour.